Well. I’ve returned safely albeit a little dusty from Burning Man in the Blackrock Desert in Nevada and my need for good healthy homecooked food is great. Home cooked meal number one for me was Kangaroo steak with sweet potato mash which I have posted before. Great home coming feast. Sautee spanish onion, garlic and lemon zest for 5-10 mins on low heat until onion starts to caramelise. Add olives, tomatoes, lemon juice and white wine and simmer for about 10 minutes. Meanwhile steam double peeled broadbeans and grill snapper. 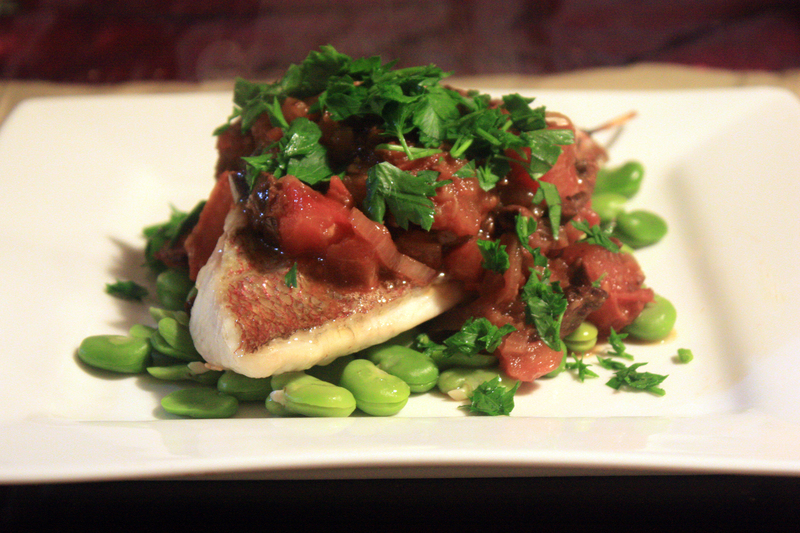 Place the snapper on top of the broadbeans, top with spanish style sauce and a handful of finely chopped flat leaf parsley. thanks. 🙂 Loving fresh broad beans right now. And it’ll be zucchini flower season here soon. Can’t wait.